The VOITH Linear Jet (VLJ) combines the best properties of propellers with the best properties of waterjets. For this product, one of the most important design challenges is to maintain a high efficiency across a wide operating range while delaying the onset of cavitation. VOITH Turbo makes intensive use of CAESES to design the full VLJ system which includes the tunnel and hull geometries as well as the rotor/stator geometries. The optimal integration of the VLJ into the ship hull is realized by a separate CAESES geometry model, see the following picture. In order to find the best shape that meets the customer specifications, a set of geometric parameters (tunnel length, integration depth etc) is created and used in a simulation-driven, highly automated workflow. 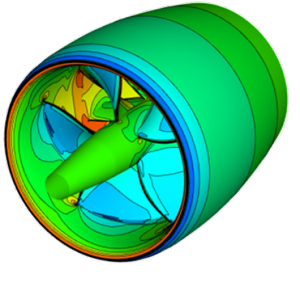 These parameters are changed automatically while – at the same time – the rotor, stator and nozzle geometries are also varied. This makes sure that the hull shape and the VLJ are a perfect match. The blade parameters are defined on cylindrical sections. Typical parameters are radial distributions for chord, thickness, camber, skew, pitch and rake. For the block-structured meshing process, additional parametric support geometry is created. 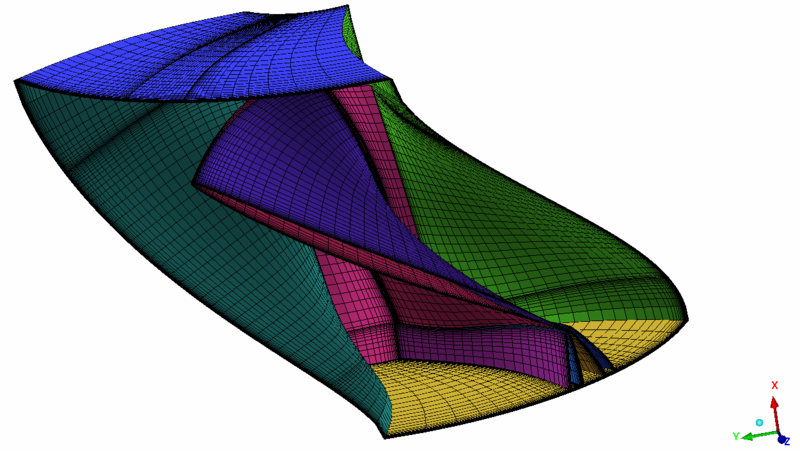 Based on this geometry, the meshing process can be fully automated in order to be used in design studies and shape optimizations. The surface mesh itself has a high density in regions of interest, such as leading edge, trailing edge and the gap between nozzle and blade tip. The parameters of the blades, the nozzle, the hull and the tunnel can be varied automatically by using the in-built CAESES strategies for design studies and shape optimizations. The simulations run on the internal HPC systems at VOITH Turbo. The huge amount of computational power plus the automated design process with variable & robust geometry allows VOITH Turbo to investigate a large set of different VLJ systems, to finally pick the best design candidate for the customer. A short summary of the linear jet case study can be found in this tech brief (PDF).